Pond lights are essential for enjoying your garden sanctuary after dark. Pond lighting also assures greater safety around water features by highlighting the different depths of your pond. Use a combination of light sources to illuminate your garden pond and waterfall. 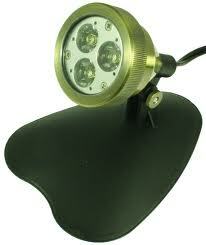 Submersible lights can be placed in the bottom of the pond, or built into the sides. Spotlights of various wattage can light pathways, plants, and pond statuary. Floating lights can create an attractive feature on the surface of the pond, adding color and texture to the surface. 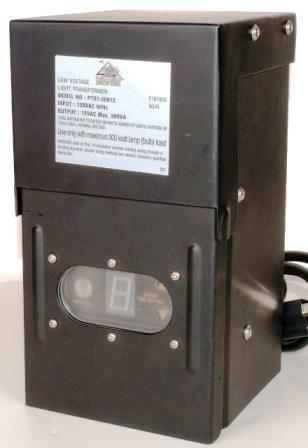 TJB-INC also sells a selection of different Low-Voltage Transformers & Low-Voltage Wire to complete your project. Adding pond lights is a great way to bring your water garden to life after dark. There are a few things to think about when setting up pond lights. #1 - Point Pond Lights Away From the Viewing Area. When placing your pond lights, it is always suggested to point the lights away from the viewing area (where you sit or stand to enjoy your water garden the most). This will prevent the lights from shining in your eyes when trying to enjoy the view. #2 - Selecting the right light. Pond lighting is generally 12 volt. 12-Volt is much easier and safer to work with then standard 115v power. 12 volt power is produced by simply adding a transformer. There are basically two types of lights spot lights and flood lights. The difference is that a spot light will produce an intense light to directly light up a subject or feature, where a flood light can provide a glow on a larger target. Tip: It is recommended to use only 90% of the total transformer output to maximize light potential. For example: a 300 watt transformer should have a maximum of 270 watts of watts. That would be equivalent to (5) 50 watt lights and (1) 20 watt light. Please Note: Some pond lights will come with their own transformer. #3 - Combo Underwater Lighting and Landscape Lighting. Don't only think of adding pond lights to light up the water. Make sure to add some landscape lighting to show off your landscape and set the tone.